BibleGateway.com is the leading Bible translation website used to provide hyperlink scripture references on this and many other websites and is used by people around the world to read the scriptures. If you only use BibleGateway occasionally to check a verse or look up an alternative translation, you are missing out on the use of a tremendously helpful full-fledged (and free!) Bible study tool. You can jump directly into Bible study as simply as typing a scripture reference or a topic into the search box on the left and choosing a translation on the right; but if you take the time to learn a little bit about the site, you will find it an amazingly flexible and powerful tool for use in your personal Bible study. This article will show just a few of the ways in which you can use BibleGateway.com to do a study of faith (or any other topic, of course). 1) OPTIMIZE YOUR SITE: When you open BibleGateway.com, take a moment to look around and you will see many features. At the very bottom of the page you will find a number of useful links and the very last one, next to the social media icons, is "Preferences." Click the link to set up your preferences - for language, translation used, references and many other options. You can start a search right from the homepage using the search box. 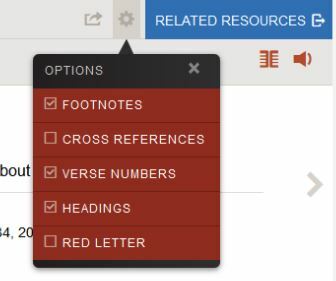 Choose a Bible version (NIV is the default) and type in a verse reference, a word or words, and a drop down menu will give you helpful variations. Note the speaker button in the grey icon cluster to the right of the page if you want to listen to the scripture being read out. 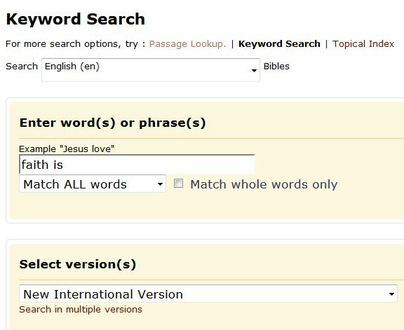 4) FINE TUNE YOUR SEARCH: With Keyword Search you can choose the language of the Bible (about 60 choices! ), the version, and whether you want to match all the words of your search exactly or not. You can also choose other options - including whether you want all the verses mentioning your keyword in the Old Testament, New Testament or even parts of these such as in the Gospels or Epistles. Finally, you can even choose a range of books such as Proverbs to Song of Solomon or 1 Samuel to 2 Chronicles. Notice the navigation options you have around the text. The arrows on each side of the scripture let you go back and forth to see the whole chapter before and after the selected verse. Incidentally, the red icons beneath the "Related Resources" button allow you to listen to the verse (speaker icon) or to add more versions (parallel pages icon). 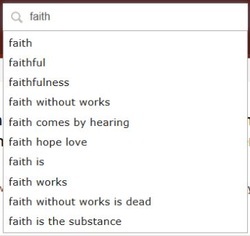 7) BEYOND THE BASICS: The examples given above use only the Keyword Search and Passage Lookup options. If you examine the other links on the Bible Gateway site, you will find more options, tools and resources. Nevertheless, just using the few tools mentioned here can help you find a verse of interest, compare it in various Bible versions, see it in context and give you all kinds of information about the background and meaning of the verse. What starts as a simple search using a word such as "faith" or a specific scripture quickly develops into a wide and multifaceted study which can bring many rewarding insights. 8) MAKING IT YOURS: Finally, don't miss the fact that by setting up an account on the BibleGateway.com site (it's free – you just provide your name and email and a password), you can save your preferences as well as mark up and save any Bible passage you read with your favorites, highlights, and notes - for sharing or continued study from any computer, anywhere!